Congenital glucose galactose malabsorption with hypercalcemia complicated with nephrogenic diabetes insipidus: Case report. Department of Pediatric Endocrinology, King Abdulaziz University Hospitaldah, Kingdom of Saudi Arabia. Glucose Galactose Malabsorption (GGM) is a rare inherited disorder complicated with hypercalcemia. The mechanism of hypercalcemia remains unclear. Nephrocalcinosis and reversable nephrogenic diabetes insipidus occurred as a complication of hypercalcemia. We report the case of female neonate with GGM and hypercalcemia complicated with NDI and nephrocalcinosis. Glucose galactose malabsorption, Hypercalcemia, Nephrocalcinosis, Nephrogenic diabetes insipidus. Glucose-Galactose Malabsorption (GGM) is inherited as an autosomal recessive trait. These monosaccharides are absorbed from the intestinal tract by Sodium-Glucose Co-Transporter (SGLT). GGM is caused by mutation in the gene coding for the intestinal brush border SGLT. Presenting prolonged diarrhea from the first day of life or a few days after birth, when the newborn is exposed to lactose from milk, leading to dehydration, ftt (Failure To Thrive), or death [1-2]. Replacing glucose and galactose by fructose usually, lead to the resolution of symptoms . Hypercalcemia is less common in neonates compared to adults. It is an electrolyte imbalance a condition in which calcium concentration in the blood is above normal (>2.52 Mmol/L). Parathyroid hormone secretion is controlled through the interaction of extracellular calcium with specific calcium-sensing receptors (CaSR’s). As in this case due to high levels of serum calcium it led to the suppression of PTH. Acquired Nephrogenic Diabetes Insipidus (NDI) occurred as a complication of hypercalcemia. The main characteristic of NDI is impaired AVP-induced water reabsorption resulting in symptoms of polyuria and polydipsia high serum osmolality and low urine osmolality . We report a case of glucose, galactose malabsorption with a complication of hypercalcemia and nephrogenic diabetes insipidus in female infant. A 35 days old Yemeni female, full term to first degree cousin parents presented with severe dehydration secondary to vomiting, diarrhea and polyuria since birth. The family reported death of another sibling at the age of 15 days with normal other sibling. Mother has multiple small renal stones in addition to repeated lower back pain. Positive history of family members from the mother’s side of having renal calcification, but unfortunately, we couldn’t investigate them as they are not living in Saudi Arabia. On examination her weight 2.8 kg below 3rd% (50th 4.5 kg), height 48 cm below 3rd% (50th 56 cm), no signs of facial (percentile) dysmorphology or obvious musculoskeletal abnormalities and no other associated congenital anomalies with Clinical appearances of mottled skin, lethargic, cachectic looking, sunken eyes and depressed fontanels. The heart rate was 122 beats/min, blood pressure was 98/73 mmHg and the temperature was 38°C. She developed hypercalcemia with Calcium concentration of 3.26 Mmol/L (normal, 2.12-2.52 Mmol/L) as revealed in laboratory investigation Table 1. In addition to nephrogenic diabetes insipidus as revealed Table 2. Ultra sound showed left kidney nephromedullary calcinosis (Figure 1). Glucose-galactose malabsorption is caused by mutation in the SLC5A1 gene, which provides instructions for producing the sodium/glucose cotransporter protein SGLT1. The malabsorption stems from mutations in the gene coding for the intestinal brush border sodium-glucose co-transporter (SGLT1). This gene is located on the distal q arm of chromosome 22 [1,2,5]. These monosaccharides have similar chemical structures, and normally they enter into specific cells in the small intestine where they are absorbed and transferred to other cells with the same transport enzyme. Glucose-galactose malabsorption occurred because the transport enzyme does not properly function, as a result of the mutation in sodium-glucose co-transporter located on chromosome 22. GGM is characterized by neonatal onset of profuse osmotic watery diarrhea as a result of accumulation of unabsorbed monosaccharides (glucose, galactose) in the intestinal lumen and can lead to severe dehydration, hypernatremia, metabolic acidosis and weight loss when fed breast milk or regular infant formulas and death if left untreated . Mutational analysis was not done due to its unavailability. Elimination of glucose, galactose, sucrose and lactose from the diet results in immediate cessation of diarrhea. The diarrhea recurs if the infant fed formula contains any of these sugars . The fructose-based formula is the only effective treatment for these patients. The pathogenesis of hypercalcemia and nephrocalcinosis remains unclear, in our case it was not mediated by hyperparathyroidism, as the level of parathyroid hormone detected was suppressed as mentioned due to hypercalcemia and not due to hyper vitamin D which was normal as revealed. Several factors may therefore have predisposed our patient to nephrocalcinosis. The glucose-galactose malabsorption may lead to hypercalcemia, which would increase urinary calcium excretion. In addition, the lactose effect (by nonhydrolyzed lactose that has a direct enhancing effect on calcium absorption in the ileum), dehydration, and metabolic acidosis may have been contributory factors [6-8]. As reported in this case the urine calcium was high. The cause of hypercalcemia was unclear as reported in other literature. Pahari et al. reported an association of GGM with nephrocalcinosis in a 2-week-old neonate in 2003 . They attributed that nephrocalcinosis was due to hypercalcemia, dehydration and metabolic acidosis. Saarela et al. in 1995 reported five children with hypercalcemia and nephrocalcinosis in association with congenital lactase deficiency . Pansu and Chapuy, assumed that nonhydrolyzed lactose enhanced ileal calcium absorption contributing to hypercalcemia . In addition, El-Naggar et al. reported two patients with persistent hypercalcemia, nephrocalcinosis and distal renal tubular acidosis despite a glucose galactose free diet . Management with hydration, diuretics, calcitonin and bisphosphonate therapy. All these therapeutic modalities have been successfully managed to reduce serum calcium within the normal range. The cause of hypercalcemia was unclear, but as an association with GGM as other reported cases in the literature. In this neonate NDI was caused by hypercalcemia, after stabilization and returning calcium to normal level NDI resolved, indicating that it was transient NDI. Polydipsia and polyuria with dilute urine, hypernatremia, and dehydration are the hallmarks of diabetes insipidus in neonate and children. Neonates who have diabetes insipidus are unable to conserve water and therefore they become severely dehydrated. This defect, which is generally reversible with the correction of the hypercalcemia, may be due to the reductions in sodium chloride reabsorption in the thick ascending limb of the loop of Henle, thereby interfering with the countercurrent mechanism, and in the ability of ADH to increase collecting tubule water permeability. The pathophysiology of hypercalcemia in cases of GGM remains unclear even though with all investigations of hypercalcemia in this case there is no conclusive for a causative factor as all other reported cases. We recommend awareness of this rare inherited cause of diarrhea with all consequent complications which is important for all pediatricians as it helps in early detection and management of such cases. Patient parents agreed to use the information (including photographs) in this case report. Turk E, Zabel B, Mundlos S, et al. Glucose/ galactose malabsorption caused by a defect in the Na+/ glucose cotransporter. Nature 1991; 350: 354-356. Wright EM, Martín GM, Turk E. Familial glucose-galactose malabsorption and hereditary renal glycosuria, in Metabolic Basis of Inherited Disease, 8th edn. McGraw Hill, NY. 2001; 3: 4891-4908. Saadah OI, Alghamdi SA, Sindi HH, et al. Congenital glucose-galactose malabsorption: A descriptive study of clinical characteristics and outcome from Western Saudi Arabia. Arab J Gastroenterol 2014; 15: 21-23. Bockenhauer D, van't Hoff W, Dattani M, et al. Secondary nephrogenic diabetes insipidus as a complication of inherited renal diseases. Nephron Physiol 2010; 116: 23-29. Wright EMI. Glucose galactose malabsorption. Am J Physiol 1998; 275: G879-G882. Savilahti E, Launiala K, Kuitunen P. Congenital lactase deficiency: A clinical study on 16 patients.Arch Dis Child 1983; 58: 246-252. Saarela T, Simila S, Koivisto M. Hypercalcemia and nephrocalcinosis in patients with congenital lactose deficiency. J Pediatr 1995; 127: 920-923. Pansu D, Chapuy C. Calcium absorption enhanced by lactose and xylose. Calcif Tissue Res 1970; 4: 155-156. Pahari A, Milla PJ, van’t Hoff WG. Neonatal nephrocalcinosis in association with glucose-galactose malabsorption. Pediatr Nephrol 2003; 18: 700-702. El-Naggar W, Balfe JW, Barbar M,et al. 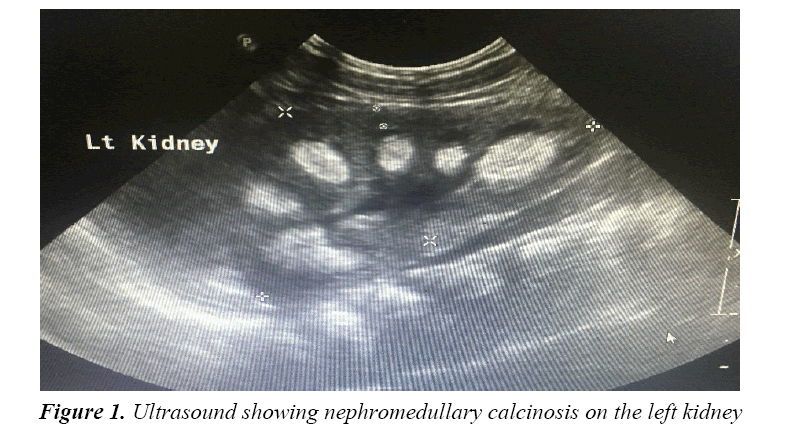 Nephrocalcinosis in glucose-galactose malabsorption, association with renal tubular acidosis. Pediatr Nephrol 2005; 20: 1336-1339.